In southwestern Turkey, near the Mediterranean coast, a dozen or so ever-burning flames light up a patch of mountain slope, just as they have done for at least 2,500 years. This is Yanartaş, which means flaming rock in Turkish. The flames of Yanartaş are reached by climbing about 1km up a sometimes-steep path just outside the village of Çıralı, in the Olympos Beydağları National Park, about 80km from the city of Antalya. The 540km Lycian Way trekking path passes through the site. Yanartaş is thought to be the Mount Chimaera of Lycia, known to the ancients for its perpetual flames and probably the inspiration for the fire-breathing Chimera monster of Greek mythology. Ruins of the ancient city of Olympos are nearby and remnants of a temple of Hephaestus, ancient Greek god of the forge, lie below the field of flames. 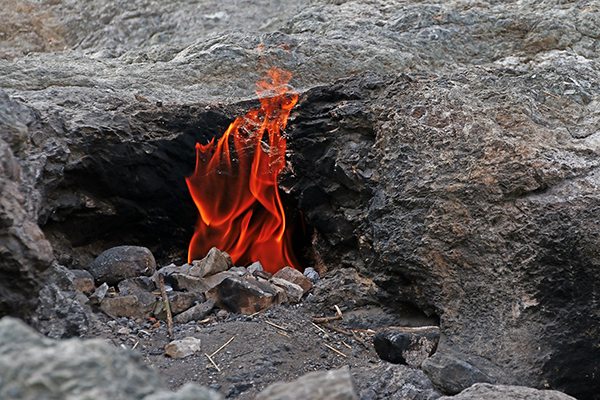 The flames of Yanartaş are fueled mostly by the methane seeping through cracks in the rock. Their intensity varies depending on atmospheric and groundwater conditions. Typically, they are bigger in winter. The park is open 24 hours a day and there is a small entrance fee. Dusk is the most popular time to visit Yanartas, but do take care. Sturdy walking shoes and a strong flashlight are essential. Bring marshmallows to toast over the flames! This entry was posted in Turkey and tagged Antalia, Çıralı, Lycian Way, Olympos Beydağları National Park, Turkey, Yanartaş by yalla2013. Bookmark the permalink.